Just a quick post for the MFP Oriental Sketch Challenge this week. For my card, I went with some gentle colors and a simple stamped butterfly that looked Oriental-ish to me. Can't wait for my MFP stamps to get shipped so I can use some real Oriental images for these challenges!!! 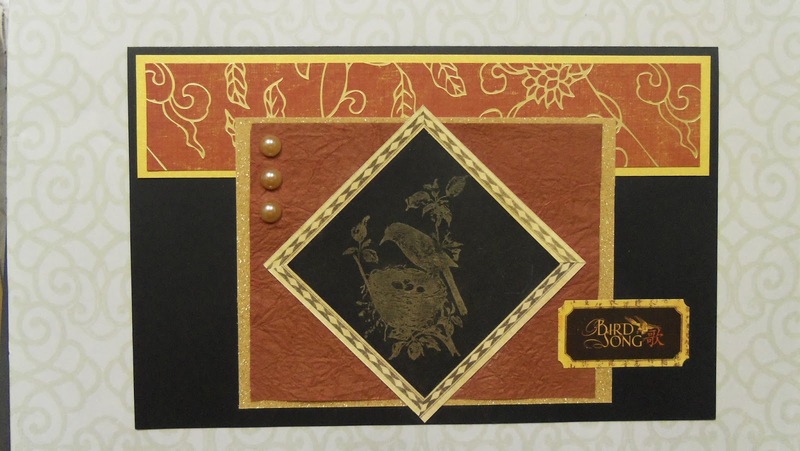 Supplies I used: various DCWV papers and cardstock, Coredinations cardstock, Staz-On black ink, thrift store stamp. Thanks for stopping by. :) Shortest post ever! Ha. 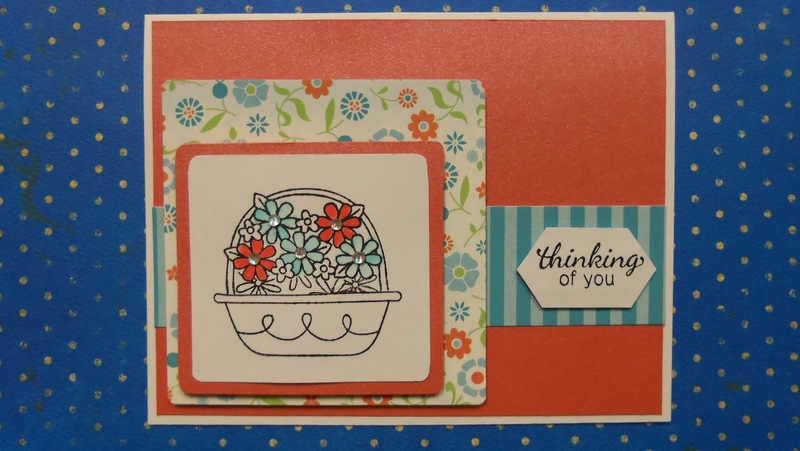 I couldn't let this MFP Speedy Fox and Friends Challenge with the charming theme of Flower Pots go by without scrabbling together a card for it. There are quite a few entries this time, which is very exciting!! However, I might not make it all the way around to comment on each one, which I like to try to do on the MFP challenges I enter. This card was fun because I got to use several items that were new to me. This was inspired by the loveable and wacky woman Darnell Knauss with her NBUS Challenge (Never Before Used Schtuff)!!! lol.... The theme for her challenge is Friendship and I think a pot of flowers is an ideal friendship gift. 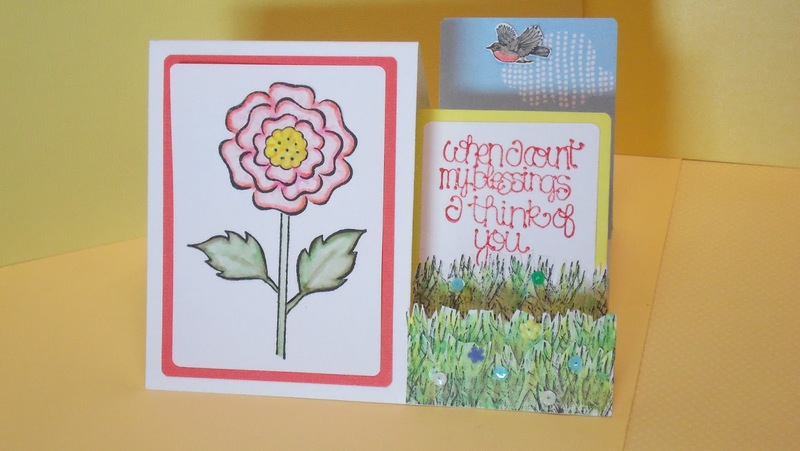 The virginal product I used for this card was from the GCD Studios Kathy Davis Happiness stack. Eeek...you can see by the date of its release that I have had it sitting idle for much too long!!! I also made use of some pretty (I think, at least) watercolor background paper that I made from some of my more epic fails in a recent MFP Cling Wrap Tutorial Time Challenge. Ha. I must have been adding too much ink or something because my glossy paper was dark and not at all attractive....not even for making a masculine type card for a guy who doesn't care about prettiness! Then I had a brilliant (for me) flash.....I wonder what would happen if I added water to these dark blotchy blobs on my precious (did I mention expensive?) glossy photo paper....and laid them down wet on watercolor paper??????? It worked!!! I was able to repurpose these ugly things, that were headed eventually to the trash, into a million (or at least 6) pieces of lovely pastel hued watercolor paper to use on my cards. I LOVE THEM!! And....the beautiful bonus was this: now that a bunch of the ink is removed, they aren't as homely as they were and I might be able to use some of them, too. So that is the "background" story on my paper. This is my very first time in using any of them. I hope that qualifies as something new for the DRS Designs Challenge with the theme of It's New. 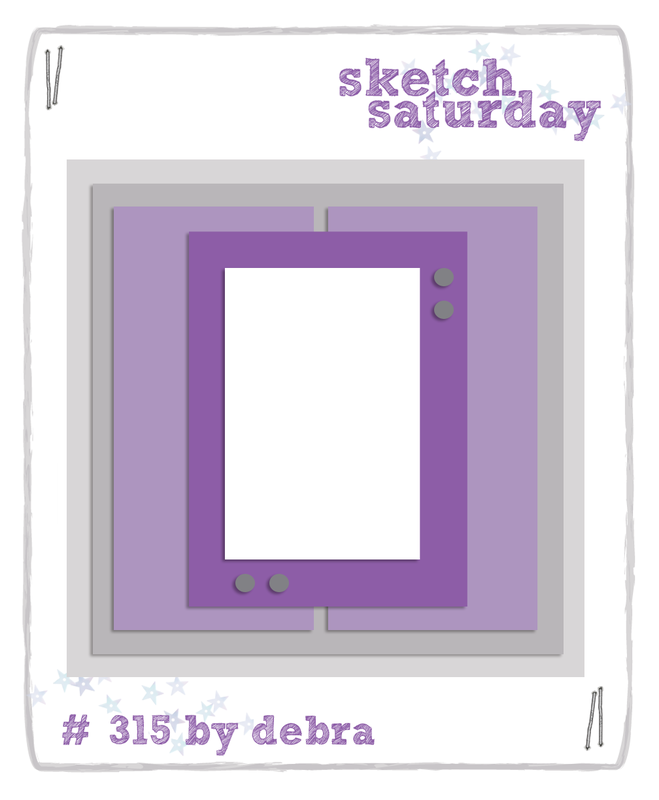 I also followed a sketch for this card from Sketch Saturday. I LOVE the crisp clean lines in this sketch and knew it would perfectly highlight the contrasts of color and black I planned for my card. Other supplies I used include: some older Stampin' Up thrift store stamps (pot, stems, two different flowers), Staz-On black ink pad, K&Co. paper, Coredinations black cardstock, and stick-on rhinestones from dollar rack at JoAnns. Thanks so much for stopping in to visit and to enjoy the pot of flowers friendship gift. Love, love, love you and your comments!!!! I have my eye out (not literally) for my next new follower and have my ginormous smile ready! "I gave my cat a bath the other day....they love it. He sat there, he enjoyed it, it was fun for me. The fur would stick to my tongue, but other than that...."
Well, I took the plunge and gave the MFP Tutorial Time Vintage Photo Challenge a try. I wasn't at all sure I had any old photos I wanted to sacrifice for a card.....or that would even be suitable....but I found this one which appears to be a racetrack with horses walking around the course. Who knows what in the world it really is????? I also followed this Feeling Sketchy Challenge plan. It was just simple enough to not overwhelm my photo with too many fussy details. The only details I added were some black photo corners and some thrift store ribbon and seam binding that I layered together. 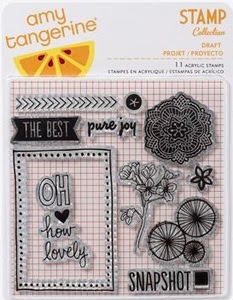 My little sentiment, stamped and embossed in black, is from a discontinued Amy Tangerine Draft set. It seemed to fit in with my theme. So what to do with a card like this??? (If it doesn't have flowers on it, I am kind of at a loss!!! Ha.) It is definitely masculine, so I might stamp Happy Birthday inside this card and send it to my Dad who will 91 next month....not sure yet. Thanks for stopping by and always leaving such nice comments on my challenge attempts!! Your visits and comments mean a lot to me. Also............I have a NEW FOLLOWER!!!!!!!!! So get ready for one of my ginormous new-follower smiles. This smile is for you, Joyce Evans Erb. Thanks so much for becoming a follower!!! 1. MFP Speedy TV - Inspirational Challenge #68 Doors with this as one of their wonderful inspiration photos. I love that vine of flowers around that brightly painted door!!! 2. 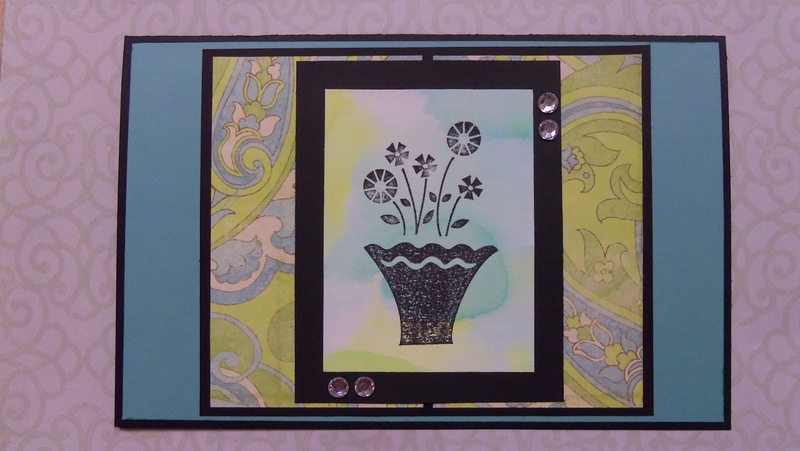 The Color Me Scrappy Challenge with this amazingly gorgeous color palette and a twist of using floral patterned paper. 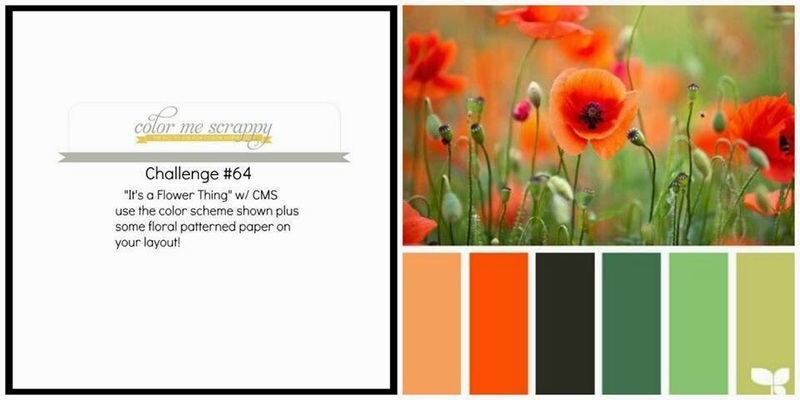 Love this color combo and the photo of the field of poppies!!! 3. The TechnoScrapper Monday Lunchtime Sketch Challenge with this inspired sketch. Love the row of 3 flowers!! Put them all together and what's that look like? Supplies I used include: DCWV cardstock from The Sweet Blossom stack, Coredinations cardstock, Prima flowers, May Arts Ribbon (vine), Serendipity Thinking of You small sentiment stamp which was part of a prize (THANKS, Serendipity!! ), Want2Scrap self-adhesive pearls, and thrift store ribbon (cream). Thanks so much for stopping by my blog. Your comments make my day!!! "The cat could very well be man's best friend but would never stoop to admitting it." 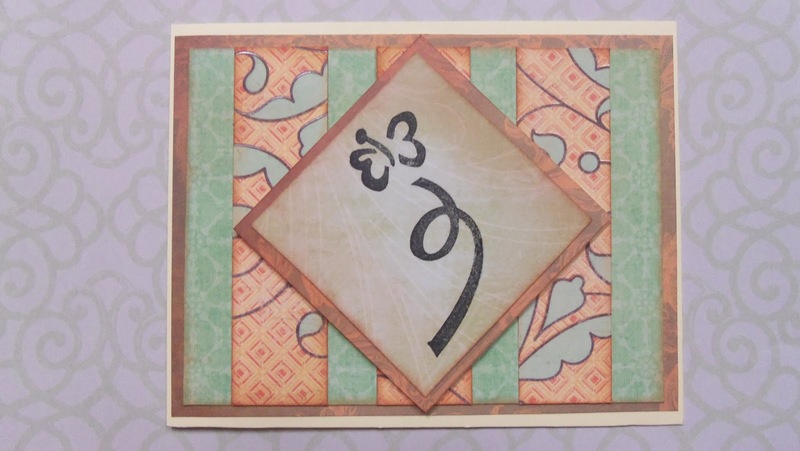 I am here with another challenge card for the MFP Simple Salutations Challenge with a graduation theme. I had this CAS design in mind and am pleased with how it turned out. I used a leftover K&Co. graduation sticker for the cap, trimming it as close to the design as possible and inking with a black sharpie around the edges. The stamp was a clearance rack item at JoAnn's some time back. I colored the y-o-u with a Spectrum Noir marker. I free-hand (eek!) traced the path of the tossed cap with a black Sakura Glaze pen. I mounted the card front onto a black card. EASY! Wow....CAS cards are sure a lot faster than my usual layered numbers!!! I could get used to that!! Ha. Thanks for stopping by my blog to have a look see. I appreciate your comments and also each of my followers!!! 4. Crafty Sentiments - CAS or Full-On Still forgot to add #3 onto my entry for being a follower. "If cats could talk, they would lie to you." I am back with another MFP Sketch With a Twist challenge card. 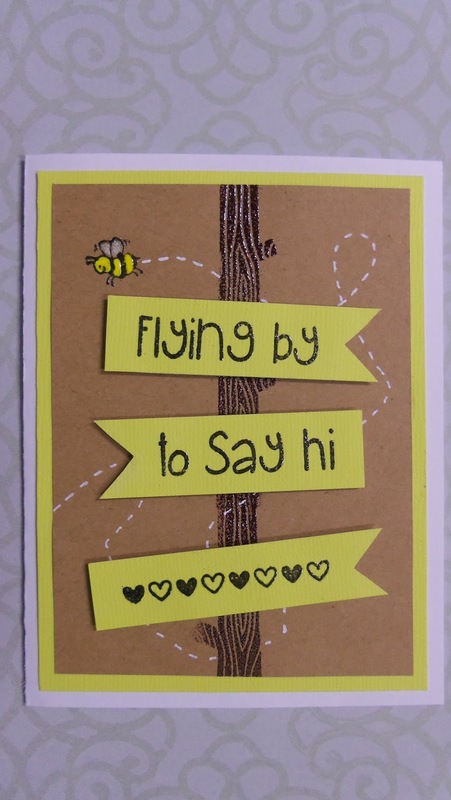 This week's twist was Travel and I did my own little twist on that theme, choosing to go with a little bee traveling to the recipient instead of a bon voyage sort of card where the recipient is the one who will be traveling. I used my Lawn Fawn - Into the Woods set for the tree. The stamp is not this long, so I overlapped the ends and hid the "seams" with my signs. :) The line of hearts is also from this set. I opened up, for the first time, my TAWS - Speak Easy set that I won awhile back (THANKS, TAWS!!) and did a wee bit of stamp surgery. The Flying by to Say Hi had been all in one long segment. I cut it in two for making this card. I could have masked, but this was easier. I like easier!!! :) The little bee is one I've had for ages.....part of a set, but I have long forgotten which one. Here's the sketch I used from this week's MFP Sketch With a Twist. Hope you like my card. I think it turned out really cute....and did you notice I am *still* using my yellow scraps??? :) Thank you for buzzing by my blog and leaving your sweet as honey comments!! 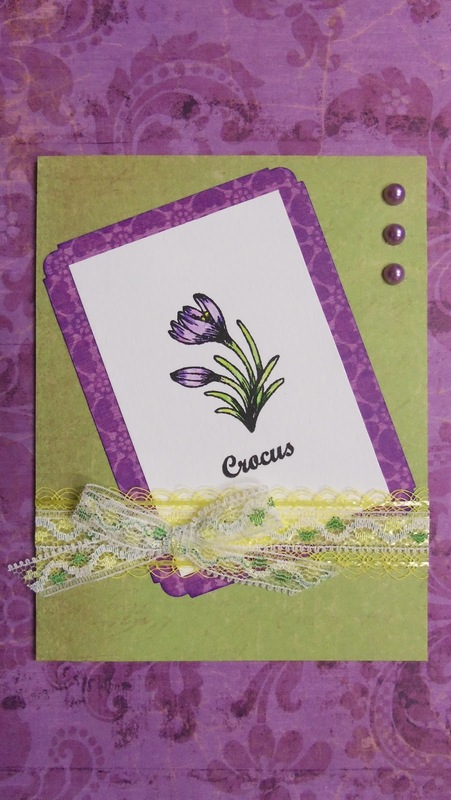 My Crocus Card (one of my personal favorites) was honored by Eclectic Ellapu (what even is an ellapu???) as a Runner Up in their Spring Challenge. I am thrilled because I really love this card. Isn't it pretty? Love it. THANKS, Eclectic Ellapu!!! "Cats are intended to teach us that not everything in nature has a purpose." This challenge card really stretched me!! But it was fun and I am so glad I gave it a try!!! This is for the MFP Friends of Speedy TV Side Stepped Card challenge. I have never made one before and wasn't at all sure I was up to it......I nearly wasn't, but I was nearly up all night making a go of it!!!!! Eeeeek! Photographing this was almost as challenging as making it! Eeek! Thanks to the terrific design team who made sample cards for this intriguing challenge, I was directed to a wonderful tutorial for making this fun fold card. It still took me a little bit of playing around to get the dimensions just right to fit my stamps, but I managed....eventually! Well, there you have my very first side-stepped card....(blushes with pride.) I really am pleased with how it turned out, so I will appreciate all manner of kind words of affirmation for the heroic hours of effort I expended in making it!!! Ha. Thanks for your visit! I seriously do appreciate each of you and count YOU as a blessing!!! "Some people say man is the most dangerous animal on the planet. Obviously those people have never met an angry cat." Is it already time for another MFP Oriental Sketch Challenge???? I guess it is. 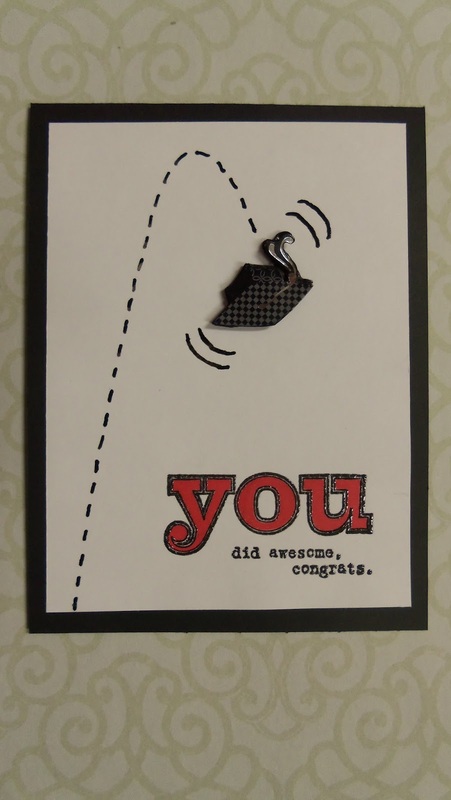 But before I get on to my card, I want to thank Lis the StampSnob (lol....what a great username!!!) for becoming my newest follower. Here's that ginormous new-follower smile, especially for Lis!!! And now about my card..... Since I've been joining in with the super-fun MFP Oriental Sketch Challenges, I've kept my eye open for Asian looking things in my stash and in thrift stores (my favorite!!) and I keep them together in one craft box. After I played with Perfect Pearls recently for this card, I had several leftover images and I thought this shimmery bird (stamp discontinued from Unity) looked suitably Oriental. So I used it for this challenge, along with scraps from recent cards that may or not be recognizable to my casual reader. Here's this week's sketch that I followed. As you can see, I flipped it 90 degrees to make a horizontal card. Other supplies I used: DCWV cardstock - various, Graphic 45 scraps and Bird Song sticker, kind of a crinkly mulberry paper from my stash, and my favorite color of pearls - Want 2 Scrap - LeCreme. This color seems to blend with so many of the color palettes I use. Love them!! Thanks so much for stopping by to see my card. Your support by leaving comments and becoming followers means a ton to me!!! Have a lovely day! "Cat: A pygmy lion who loves mice, hates dogs, and patronizes human beings." I am back with another sensational MFP Color Challenge, this time in light blue, golden yellow, and tan. Lovely colors to work with!! In my determination to use scraps only, the first scrap of light blue paper I pulled out was this dreamy blue sky with fluffy clouds from an old MAMBI stack. That was the basis of my whole card! Next I started looking at my fantasy kind of stamps and found this one from a neglected and unlabeled set that was a thrift store find. Perfect! Then I had to find a dreamy kind of sentiment. This Laughter, Imagination, Dreams from Unity that I had won (THANKS, Unity!!) was ideal. I masked off the butterflies that are a part of the stamp. 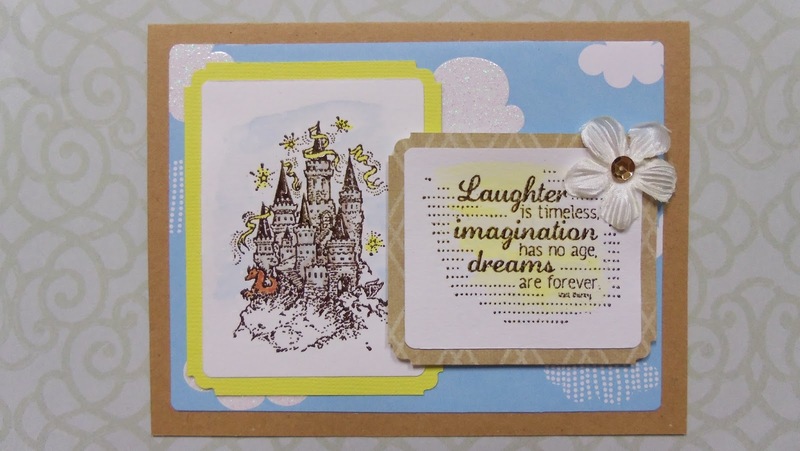 I had forgotten when I grabbed it that it was a quote from Walt Disney....which made the castle stamp even more appropo! Love it when that kind of thing happens!!! 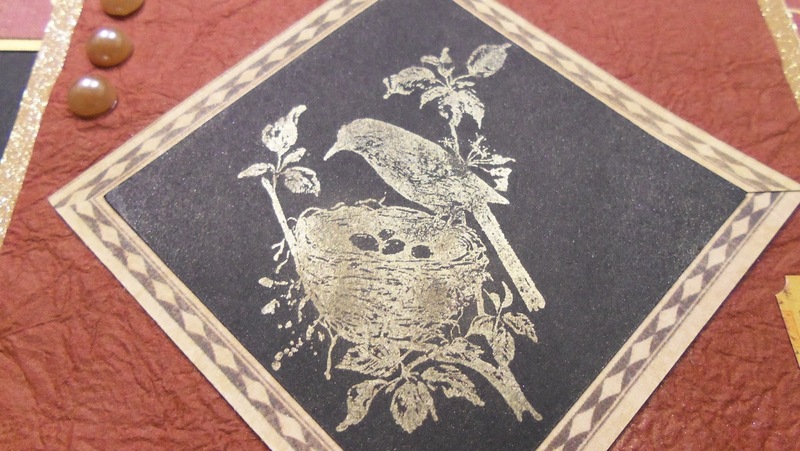 I heat embossed both stamped images with clear bark transparent embossing powder. I did some very understated watercoloring on the castle and took a few swipes with the yellow on the sentiment. 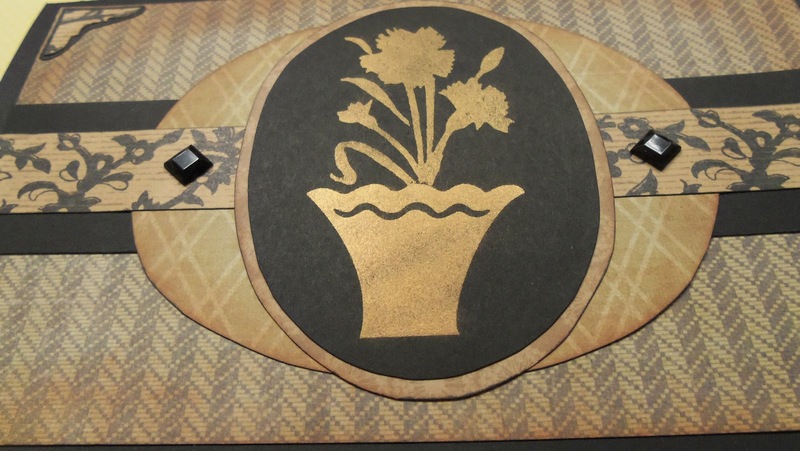 I finished things with a Prima flower with a gold sequin center. Other paper and cardstock is from DCWV and Coredinations. Hope you like my magical card! It was fun to use the fantasy stamp....definitely out of my usual genre. "What's virtue in a man can't be virtue in a cat." Welcome to my catch up post. You might be wondering what in the world a catch up post even is.......or you may have a very good idea. It is where I catch up with my acknowledgements and thank yous that I am very behind in. #2 -- My dear husband actually looked through my entire blog the other day. I was SO IMPRESSED!! <3 <3 <3 He asked me where I get all my cat quotes. I have an old 2006 Daily Calendar with 365 Daily Thoughts & Inspirations about...Cats. I started at Jan. 1 and use one of the daily quotes for each post. Usually it is in consecutive order. I am on Feb. 10 for today's quote. #3 -- Another one about my dear husband. He did something really sweet for me. He printed up some clear stickers with my blog address on them for me to put on the backs of my cards. I already have a pretty "J" stamp that I use, but these will be really nice. I started trying them out the other evening and am still experimenting with positioning. #4 -- Next, I want to say a huge thank you to Mark's Finest Papers. Have you noticed all the challenges from MFP that I enter???? Well, I don't quite understand how it has happened, but my name has gotten drawn out of the hat as a winner a whole bunch of times. I haven't received any of my prizes just yet, but I want to thank them for their amazing generosity in giving away a stamp set with each challenge. Wow! That site is just amazing with tutorials, hops, challenges, and tons of inspiration. Because I have been a (very, very, very, very, very, very, very) lucky winner, I also get to display this badge on my blog. #6 - Hey, here's one that I won because somebody actually liked my card! 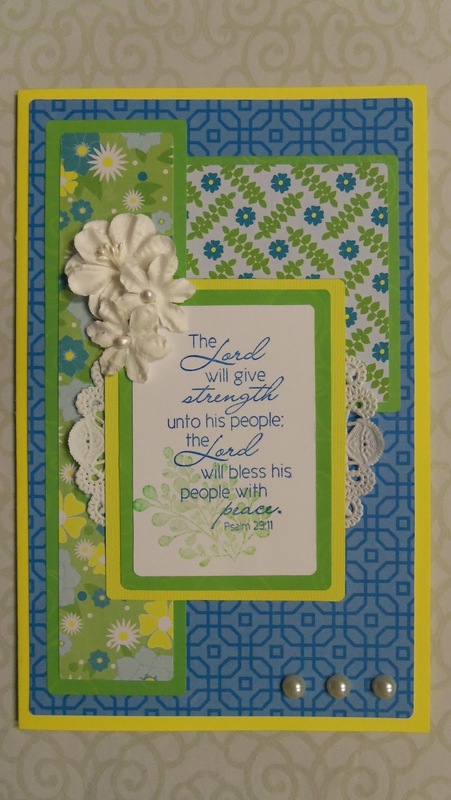 This card was honored as a runner up in the Perfectly Rustics Inspirational Photo #23 Challenge. #7 -- Okay, here's one more project that I won on its own merits. This was several weeks ago and I just haven't taken the time to post about it. :o This mini-album was honored in the Top 3 at Creative Corner Challenges in the Team Mel: Baby challenge. This gives me the privilege of displaying this cool badge on my blog. Thanks so much, Creative Corner Challenges!!! Whew........all caught up!!! A humongous thank you to all the challenge blogs who work so hard to keep the fun and games interesting and inspiring. I learn so much from all the DT members and the other entrants!!! Have a lovely day.....and if you need rain, come to Idaho. I'll give you some!!! Edited to add: Squeal!! 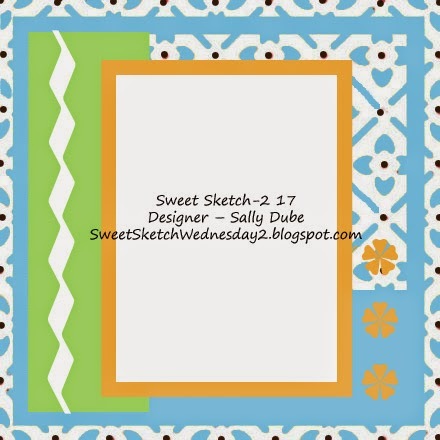 I just noticed that this card made the Top 3 in the Sweet Sketch Wednesday 2 Sketch Challenge!!! This gives me the privilege of displaying their Top 3 Badge, also. Yippeeee!! 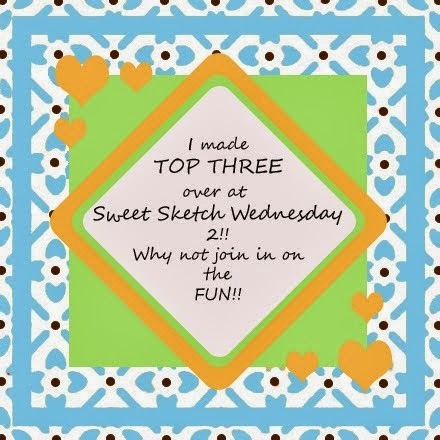 THANKS so much, Sweet Sketch Wednesday 2!!!! "Cats were put into the world to disprove the dogma that all things were created to serve man." I am back with a plate of leftovers......that is, a card made from scraps leftover from my most recent card. 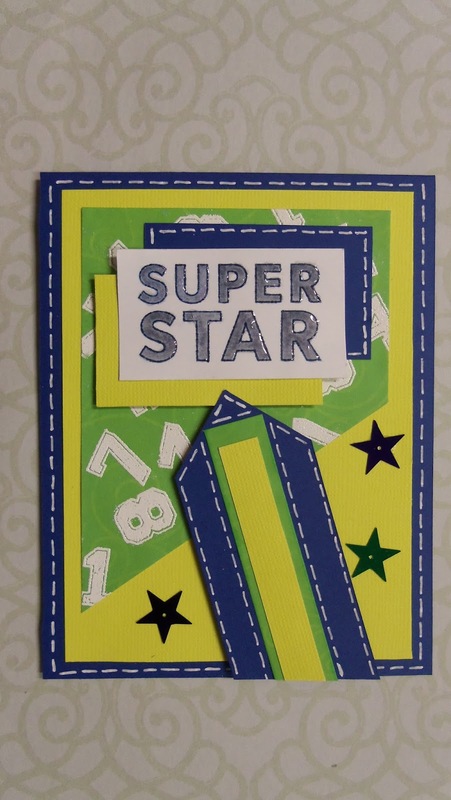 I had some bright yellow and green strips left on my craft table that got shoved next to some dark midnight blue ..............(brilliant flash) .............I think that looks like an arrow for a masculine kind of card!!! So....voila! Here's what I came up with. Now for those of you who know me, you are probably thinking this card is very out-of-character for me. And you'd be right ..... seeing as our family is about as sporty as a set of placemats! Ha. 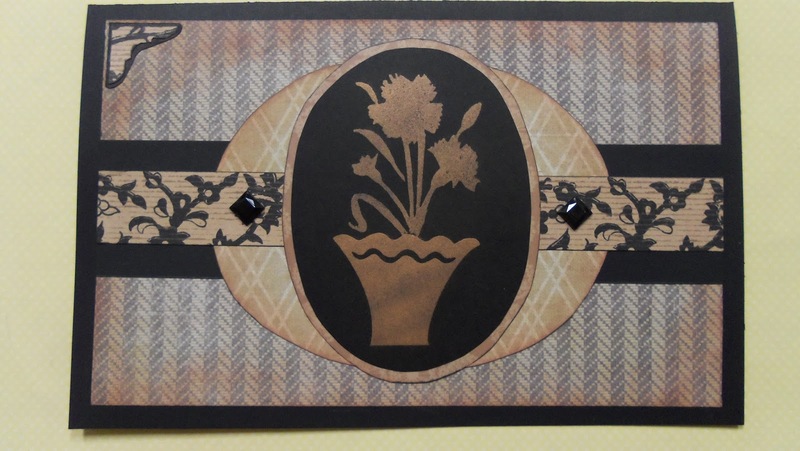 But there are occasions when I need a card for a young man and I think this will be nice to have on hand. 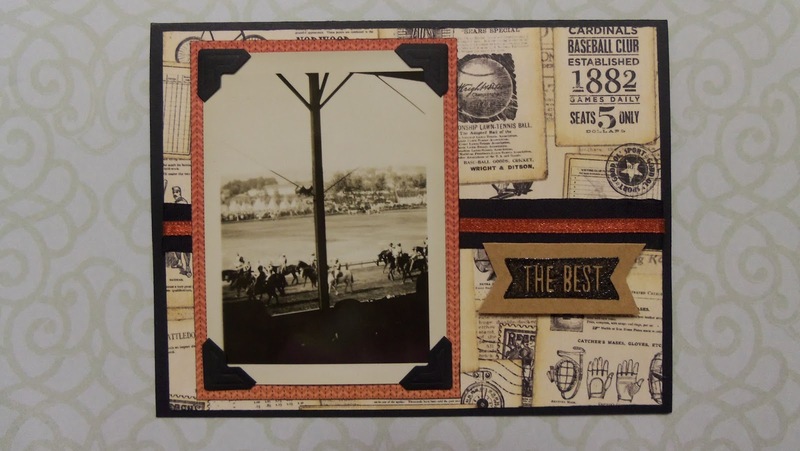 I used the Kelly Purkey Game Day stamps set I won months ago from Simon Says Stamp (THANKS, SSS!) for the white embossed numbers and the Super Star greeting. I watercolored the letters with my waterbrush and Simon Says Stamp Soft Navy ink pad and I also applied Glossy Accents for extra shine. I also got brave and did some faux stitching with my Sakura Gelly Roll white pen. I think the "stitching" really adds to the sporty look.....but what does a placemat know???!! 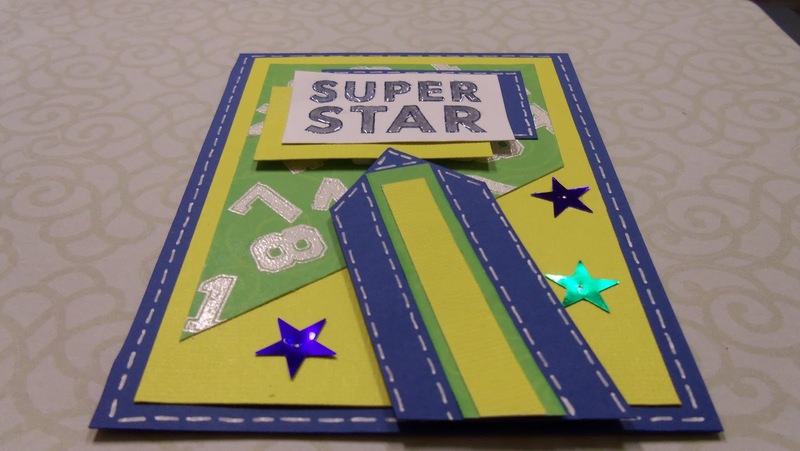 I gave this card dimension by popping up the greeting panels and the arrow with 3-D foam squares and finished it with a few shiny stars. You can compare this card with yesterday's card and see that I have a very similar color scheme, although the blue is much deeper and more masculine today. Amazing how much difference it makes! Hope you enjoyed having leftovers today. I think I need to challenge myself to do this more often!! I always have scraps leftover, but usually they sit around for a long time before I use them. In the future, I will try to turn right around and do a leftover card whenever I can. Thanks for visiting and leaving such nice comments. Your encouragement and support mean a lot to me!!! I, also, always appreciate it when someone feels like becoming a follower. Many thanks to each of you who has done that!! And I keep forgetting that I haven't yet posted my ginormous smile for my most recent follower, so here we go.... This smile is for you, Taunya Butler!! Summer to me means clear blue skies with bright sunshine and flowers. Right now in early summer, the pastures around our house have an array of wildflowers blooming. My favorites are the wild daisies with their bright white petals and sunny centers. So when I was asked to make an encouragement card, I knew what colors I wanted to use. I also knew I wanted it to have fresh clean lines and only a touch of frill. Sentiment from inside of card. 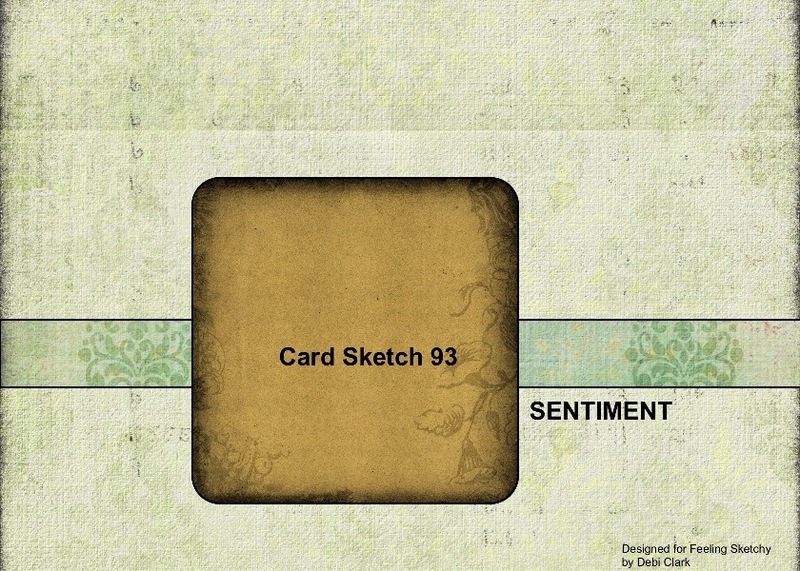 The greenery behind the sentiment on the front cover is from Verve - New Mercies set. And so are the flower and sentiment inside the card. Other supplies I used: Prima flowers and doily and pearls from my stash. #2 - The sketch I followed is the current one from Sweet Sketch Wednesday 2. I knew all the layers would look great with the papers I wanted to use. Thank you for stopping by to see my encouragement card. Have a blessed and peaceful Sunday and new week. To treat you as a trusted friend. As you can see, I went quite simple with this sketch and design. What a relief after that one sketch I did recently! Whew! :) I chose stickers of a scene and "Tranquility" from the Graphic 45: Bird Song set. 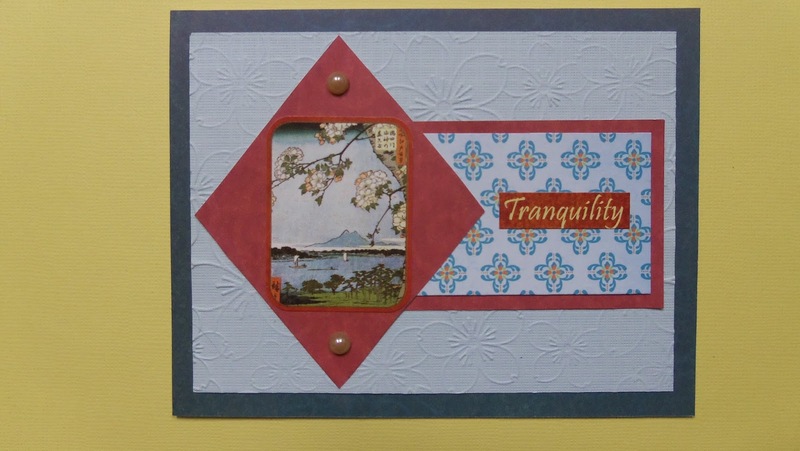 My background is embossed with a Cherry Blossom design embossing folder. Other paper and cardstock I used were DCWV. Hope you like my interpretation of the sketch!!! 1. MFP Speedy TV Oriental Challenge #40. "Some people say that cats are sneaky, evil, and cruel. True, and they have many other fine qualities as well." I am here with yet another MFP Challenge. This one is their current Tutorial Time on Speedy TV - Cling Wrap Background. This looked like such a fun challenge that I just had to try it out. But, woe is me with trying to get my camera to capture the true colors! What I love about the Tutorial challenges is the fabulous...yes...tutorial that is included with each challenge. Super interesting and fun to try. I tried and tried but totally could not get a card to come together for last week's pillow top tutorial challenge, so I really wanted to try this week's. On a side note.......am I the only one that Father's Day sneaked up on???? I forgot that June 1st was a Sunday and so I thought I still had another week!!! I am so lame! Anyway, when I discovered Father's Day was this Sunday, I knew I would need to scramble and get a card ready to mail tomorrow with some goodies I have for my dear Dad. So, I hunted around for my glossy cardstock for this challenge and, naturally, could not find it. :& I had to go to town, anyway, so I bought a small pack down there for an astronomical price......but at least I had it, and at least our small town drug store will stay in business for another day. Ha! So here's my card. 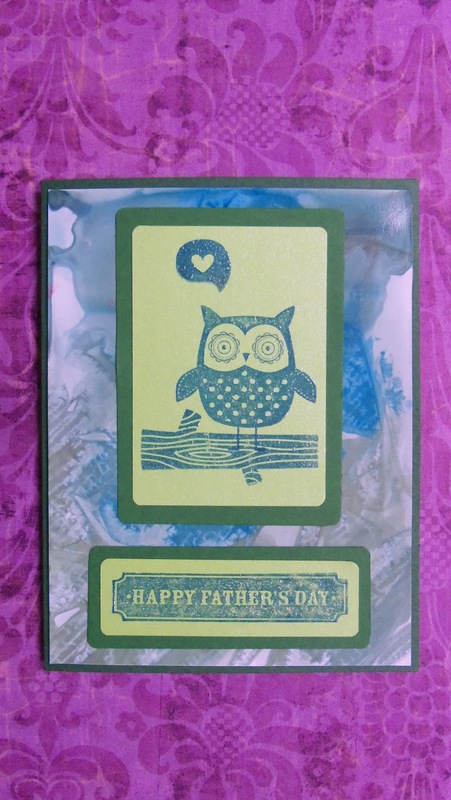 I teamed up an owl from my stash with stamps from Lawn Fawn's Into the Woods and added a Happy Father's Day sentiment. So, yes, I am posting this card as much out of sheer determination as anything, but the only challenge that will get to see it are my friends at MFP Speedy TV. I feel like I can show even my not-ready-for-primetime cards to them, especially on the tutorials. Thanks, MFP!!! "Cat-lovers will no doubt point out that the elegance and dignity of cats are the consequence of their sojourn in the temples of the gods, where their attitudes and movements were regarded as divine prognostications. Be that as it may, it is obvious that the cat's wealth of expressions make it an ideal candidate for such a role." I am back with a card I made for another MFP Challenge. Are you getting the idea that I LOVE MFP challenges????? Not only do they offer one of their fab stamp sets as a prize for each and every challenge they hold, but they have a week-long challenge EVERY DAY!!! Wowza. I play often with them and sometimes the parameters really take me out of my comfort zone. I am thrilled to be inspired to dust off (and, in my case, sometimes pet hair remove) some neglected products and try them out. These challenges break me out of my mold and I LOVE that. That's what happened with today's card. Mark's Finest Papers Inspiration Challenges make it easy to enter, because you can take inspiration from anything about the photos. I was inspired by the shimmery colors and the luminous full moon in each sensational photo. 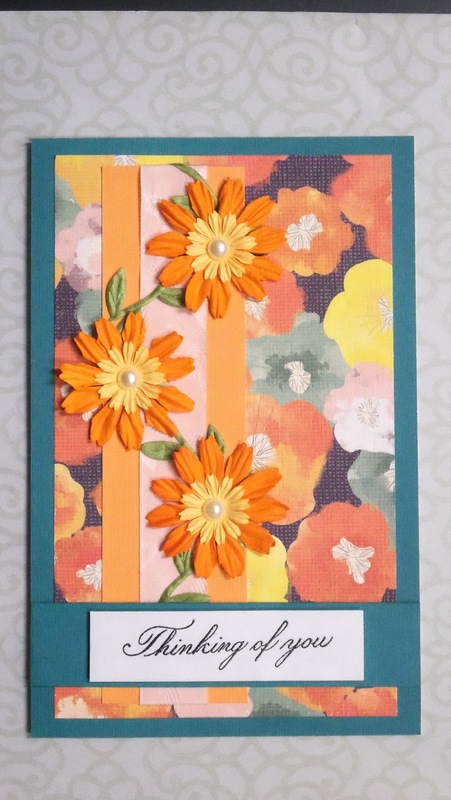 For this card, I used the Mandarin color of the Perfect Pearls. It didn't end up looking very orange, but I love the shimmer!!! Here's a shot at an angle where you can see it glow. LOVE LOVE LOVE!!! I also followed this Sketchy Colors sketch for this card. 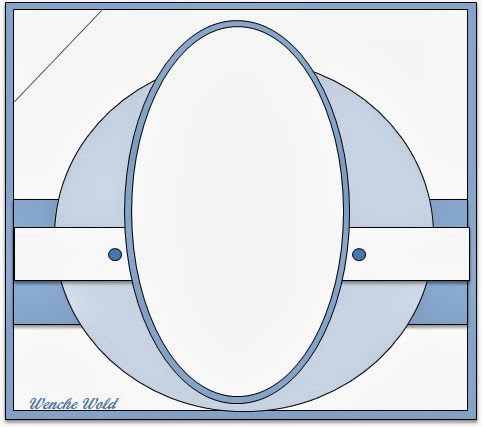 It was more complicated than I anticipated, since I had to construct my own oval stencils! All my ovals were too small. So this really took me out of my comfort zone, too. But I finally got it put together. Next time, easier sketch. Ha! Other products I used on here are DCWV paper, which I inked around the edges, and a couple of little clearance rack stick-on embellishments. Do you think my card looks like a dollar bill???? After I got the photo on here, I thought it kind of did. hehehee. Have a lovely day and thanks so much for your sweet comments. They make my day even brighter!! !